Support for the San Diego Women's March is growing. Nearly 20,000 people have RSVP'd on social media for Saturday's event. 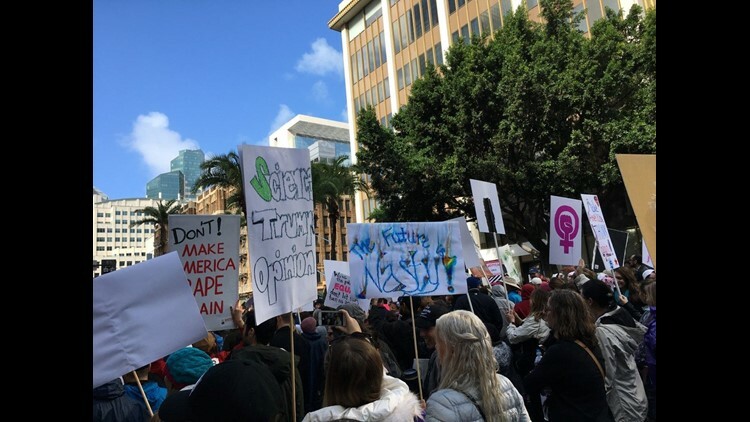 SAN DIEGO (CBS 8/CNS) - A large crowd estimated by police at between 30,000 and 40,000 people stepped off the San Diego Civic Center complex at City Hall Saturday morning in support of women's rights. The march came one day after the inauguration of President Donald Trump as the 45th chief executive of the United States, and coincided with a larger version in Washington, D.C. and dozens of other marches throughout the country. The local event began at about 10 a.m. with throngs of people overflowing from the plaza at 202 C St. onto surrounding streets and into the parking structure overlooking the event. 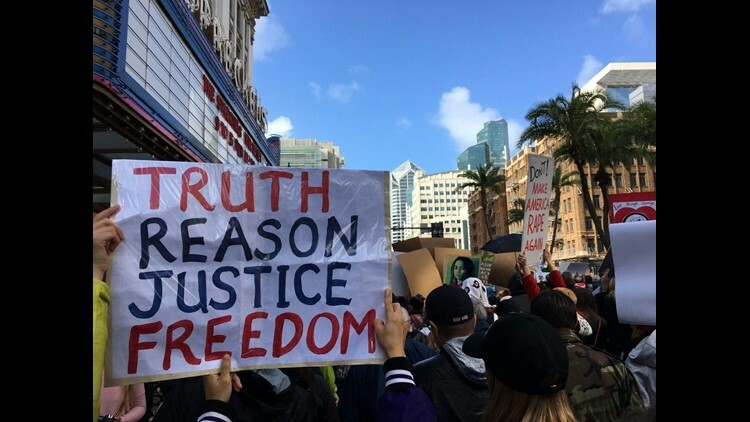 Getting to the area became a challenge as San Diego Trolley service was inundated by demonstrators, causing long waits at trolley stops along the way. Some bus service that normally covers all of the downtown area was halted at City College as the crowds became too large. Two additional Coaster trips were added to accommodate marchers coming from the North County. 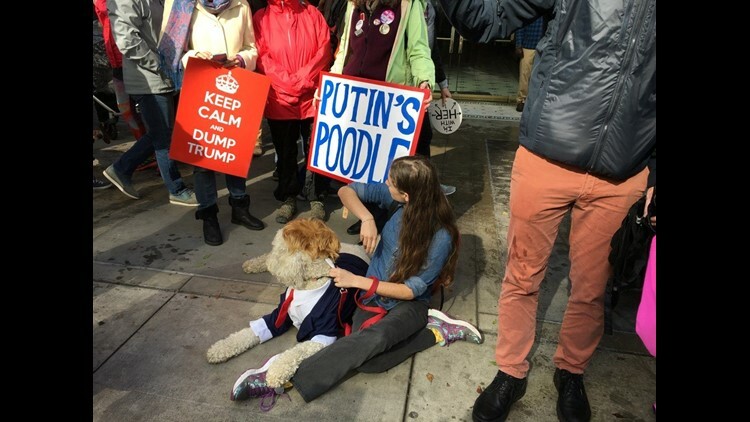 March participants carried signs reading "We don't want your tiny hands anywhere near our underpants,'' "Love trumps hate,'' "Women's rights are human rights,'' and "Putin's apprentice,'' as well as other slogans. Protesters sang the Star Spangled Banner, participated in a drum circle and heard from speakers before beginning the march shortly before 10:30 a.m. They were joined by elected officials as they headed south on Third Avenue to westbound Broadway before turning north on North Harbor Drive to the County Administration Center at 1600 Pacific Highway. A large police presence kept order and closed streets in the area. San Diego police were assisted in their efforts by the California Highway Patrol, San Diego County sheriff's deputies, San Diego Harbor Police and the San Diego Unified School District Police Department. No one had been arrested as of midday. By the time the front of the march reached its destination, there were still marchers just leaving the staging area about a mile away. 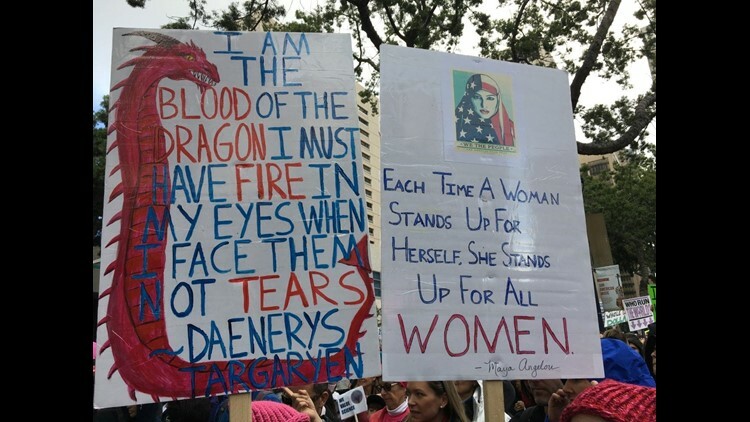 Organizers said they are dedicated to a free and open society, stand united in respect for all people and resist the marginalization of anyone. About 4,000 people marched today at a separate event in San Marcos.